I’ve often said I struggle with what I call “the blank slate.” I have friends who can walk into an empty home, look at the bare walls, and just start dreaming up a plan. I find that daunting. I’m much more useful after a few ideas are kicked around, and I start to see what will and won’t work about each of them. Then I feel the juices flowing. I used to assume this means I’m just not creative. But I’m trying to think of it differently these days. If I don’t have the knowledge or experience to design complex recipes from scratch, I can take what I like about two or three of them and combine them. If I see a beautifully textured wall hanging in a store that audibly laughs at my budget (For the people, please, Anthropologie!) I can try to figure out how to make something similar. The secret is to surround yourself with things that inspire you. If you can’t begin to imagine your dream kitchen, keep an eye out for simple, small kitchen components. One can lead you to dream up another, and before you know it you have an entire scheme you never would have imagined while staring at the blank slate. 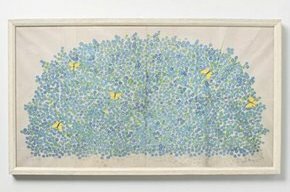 This “Butterflies Framed Art” in Anthropologie’s Spring 2011 catalog caught my eye. I’m not completely in love with the frame…but I like how simple the piece is. I have a few ideas for a replica I’d like to make and hang over my headboard. Ever hear the expression, “Let booze light the way”? No? Well, this “Found Decanter Lamp” is fantastic. I love that it takes up so much space, and I can just imagine how the light reflects off of the glass when it’s turned on. I used to have a beautiful lamp made from a Bombay Sapphire gin bottle, and it cast pale blue light onto my desk. The search is on: I must find the perfect large decanter and turn it into a lamp. As soon as I noticed it, I thought of my growing collection of wine cork bottles. 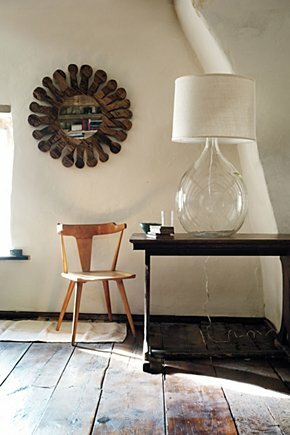 Imagine a round mirror like this with rows of wine corks extending from the center, making the same sun/flower pattern. If I can find the right mirror, I’m going to attempt it. All of this from two pages of one catalog! Seems easier now, doesn’t it?